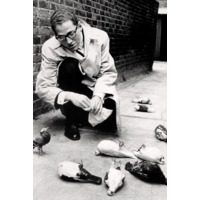 Thomas Andrew "Tom" Lehrer (born April 9, 1928) is an American singer-songwriter, satirist, pianist, and mathematician. He has lectured on mathematics and musical theater. Lehrer is best known for the pithy, humorous songs he recorded in the 1950s and 1960s. His work often parodies popular song forms, such as in "The Elements", where he sets the names of the chemical elements to the tune of the "Major-General's Song" from Gilbert and Sullivan's Pirates of Penzance. Lehrer's earlier work typically dealt with non-topical subject matter and was noted for its black humor, seen in songs such as "Poisoning Pigeons in the Park". In the 1960s, he produced a number of songs dealing with social and political issues of the day, particularly when he wrote for the U.S. version of the television show That Was The Week That Was. In the early 1970s he retired from public performances to devote his time to teaching mathematics and music theatre at UCSC. He did two additional performances in 1998 at a London gala show celebrating the career of impresario Cameron Mackintosh.